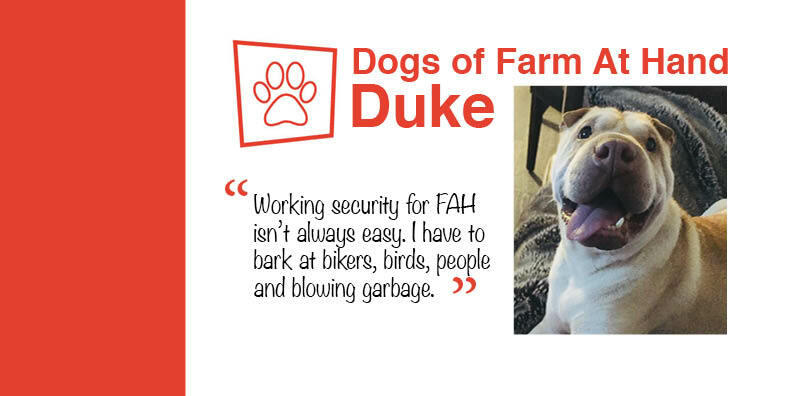 Meet The Dogs of Farm At Hand: DUKE! Hi my name is Duke, and I’m a 6 year old Chinese Sharpei. My mom adopted me 3 years ago. They say I had it pretty rough, but now I have so many toys and my life is awesome. I like to sniff other people, but when it comes to hanging out, I only like my mom. I ignore everyone but her and go on a food strike when she goes out of town. I like other dogs but my mom tells me I come on a bit strong. I’m working on my social skills, and soon hopefully I’ll have more friends. Working security for FAH isn’t always easy. I have to bark at bikers, birds, people and blowing garbage. It’s not a job for everyone, but my time on the streets have prepared me for this tough duty. My mom is the marketing and community coordinator. I try not to bark when my mom is on conference calls, because she gets angry and tells me to be quiet. It’s a work in progress. My favorite part about my job is when my mom stands up from her desk and little crumbs from her lunch fall on the floor. I clean them up and she’s really happy she doesn’t have to bring out the loud noise machine to clean it up. What’s your least favourite part about your job? My least favorite part of my job is when my mom leaves me at home. It don’t like to talk about it. Next question.